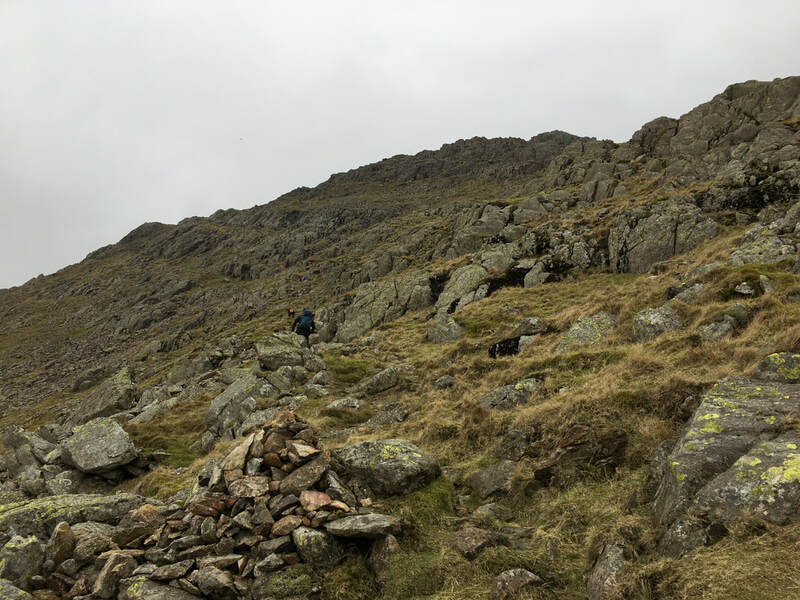 Good mountain paths mostly. 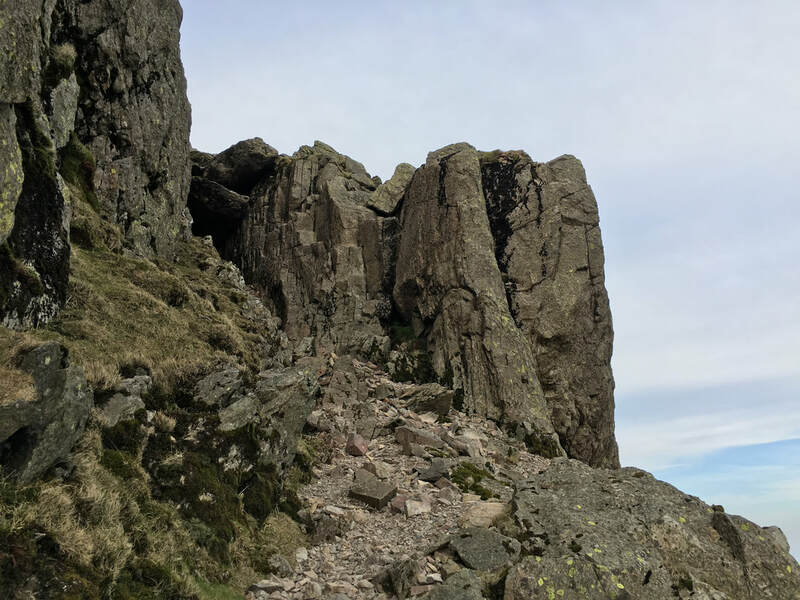 The Climber's Traverse beneath Bowfell has some very mild exposure. 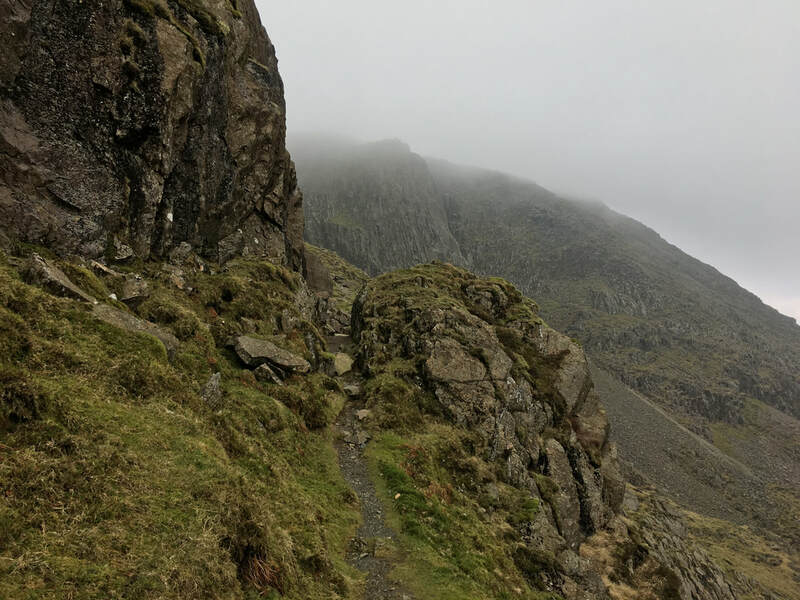 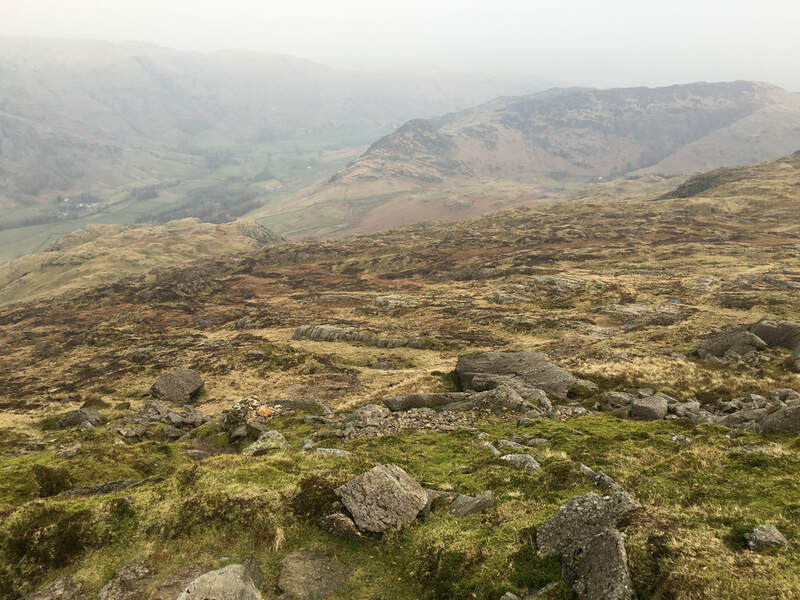 Care should be taken on the transit over Crinkle Crags in mist as the path does not follow a natural direct line. 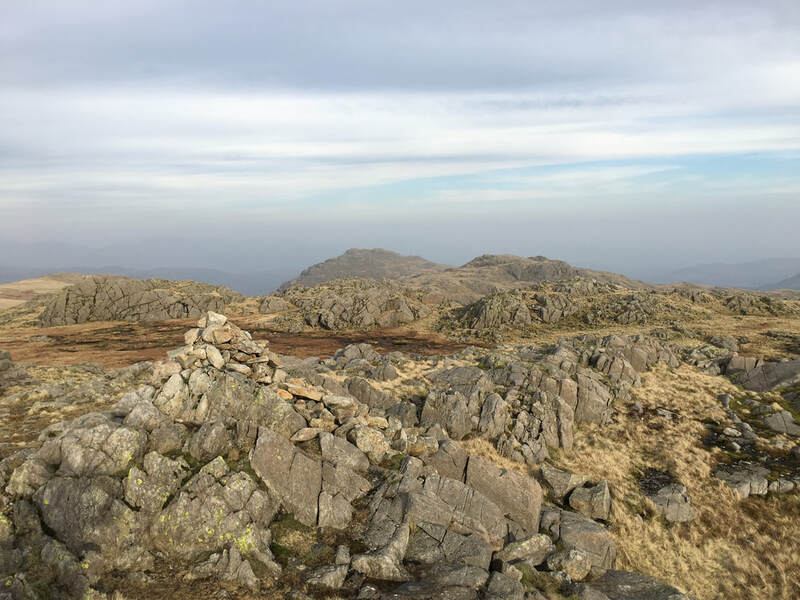 The section from Crinkle Crags to Cold Pike via Little Stand is pathless for the most part. 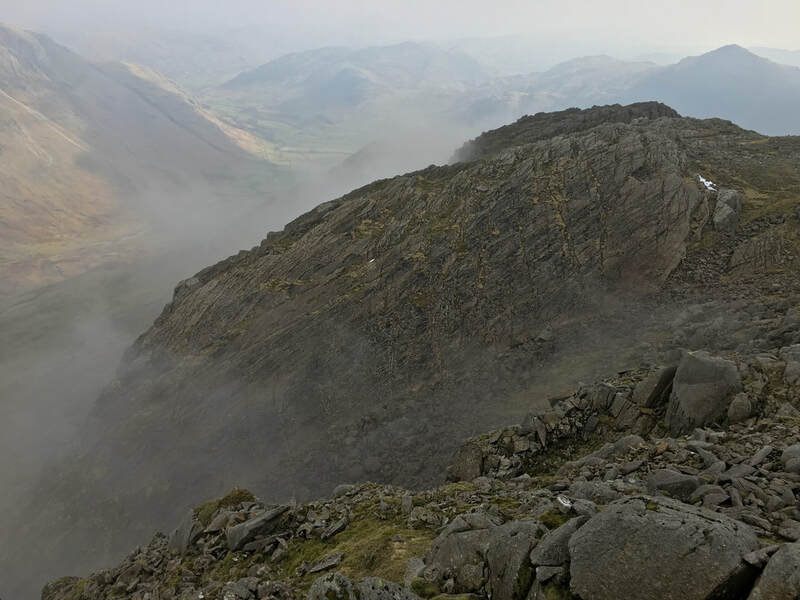 ​Bright & sunny initially followed by a spell of low cloud whilst on The Climber's Traverse. 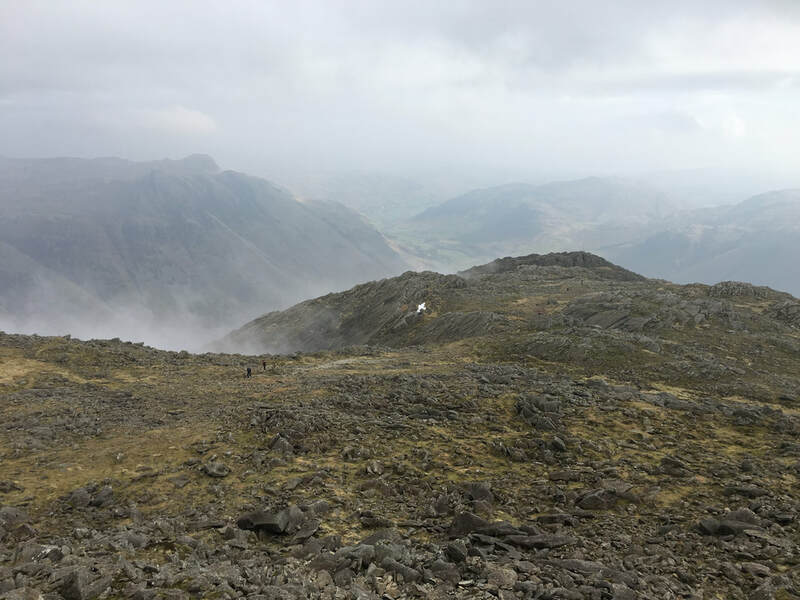 From Bowfell the conditions were mainly overcast with some sunny spells. 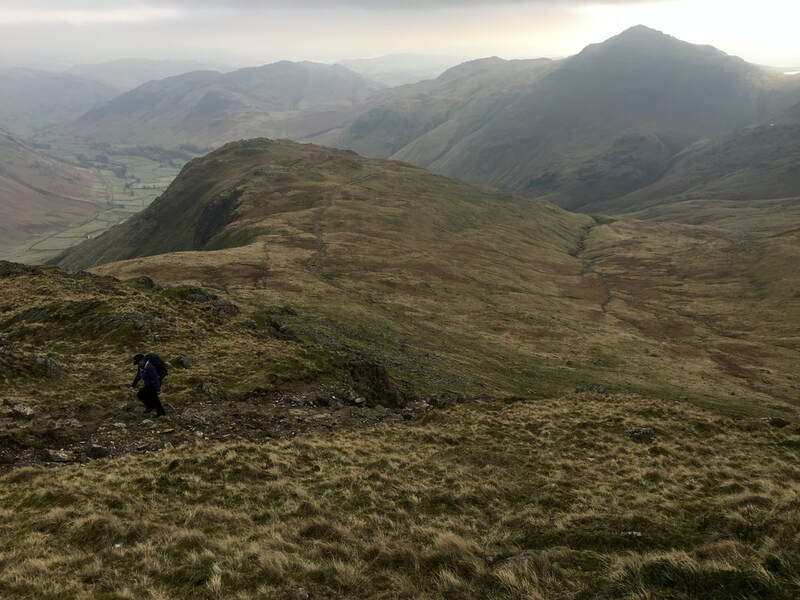 It is always a pleasant day out when you can take a different route up a particular fell - one you have never done before. 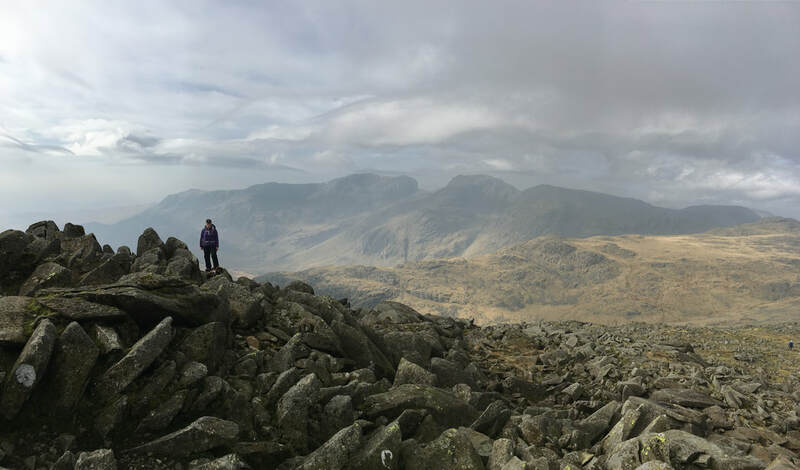 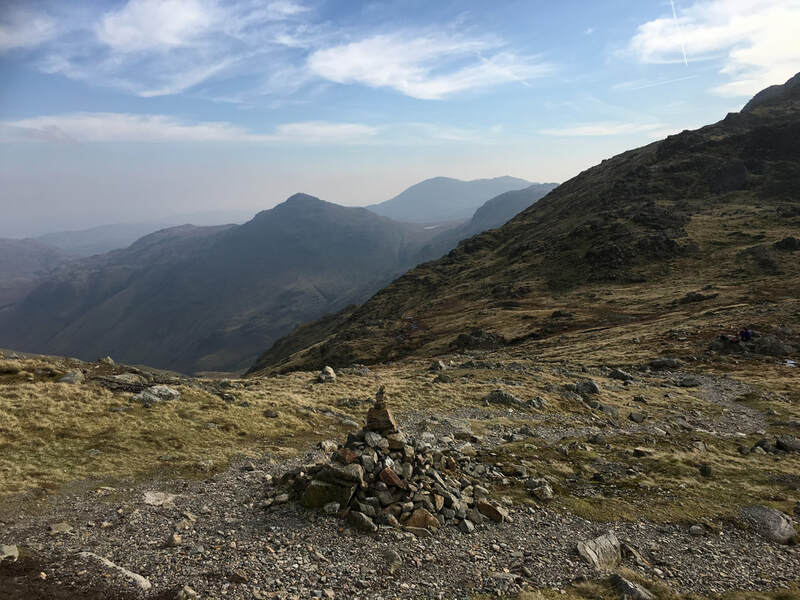 Today was one of those days whereby we would climb Bowfell via The Climber's Traverse and also transit the Crinkles from North to South instead of the other way round. 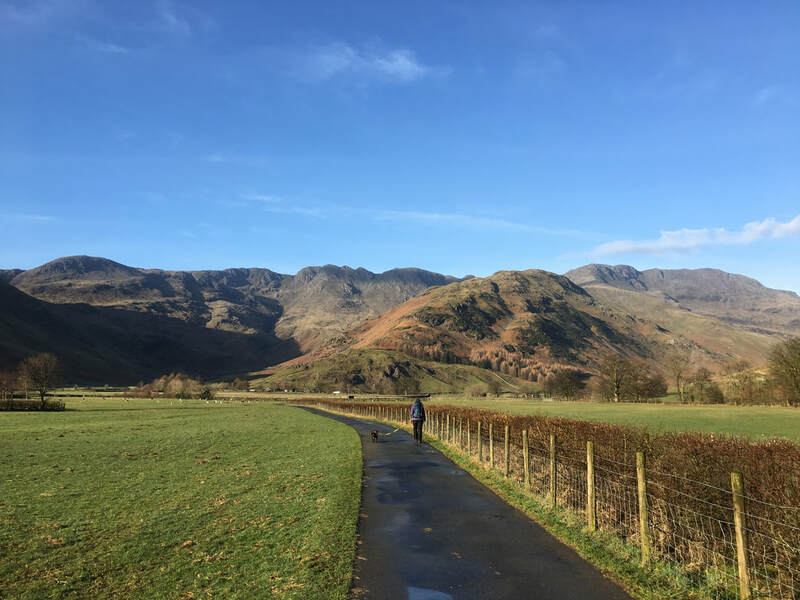 Arriving at The Old Dungeon Ghyll Hotel the weather looked extremely promising - wall-to-wall sunshine and a bright blue sky. 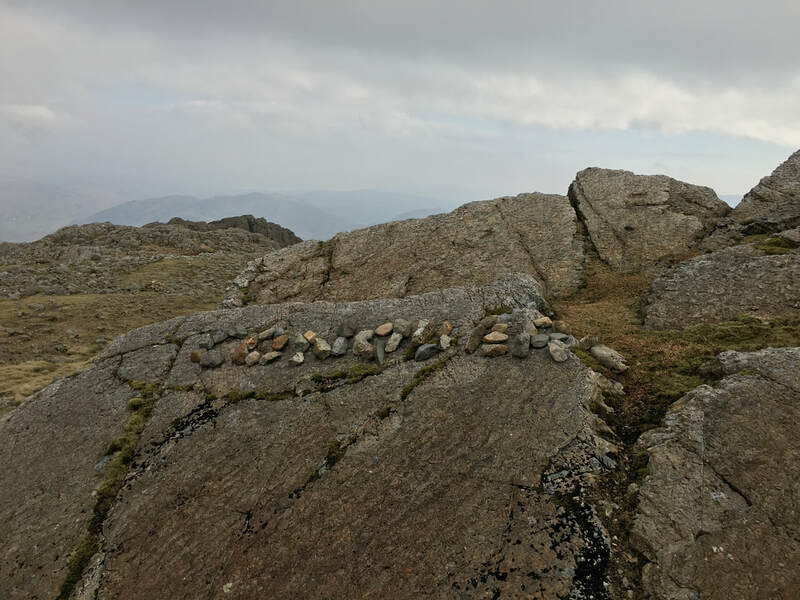 Would it hold out - let's see eh!! 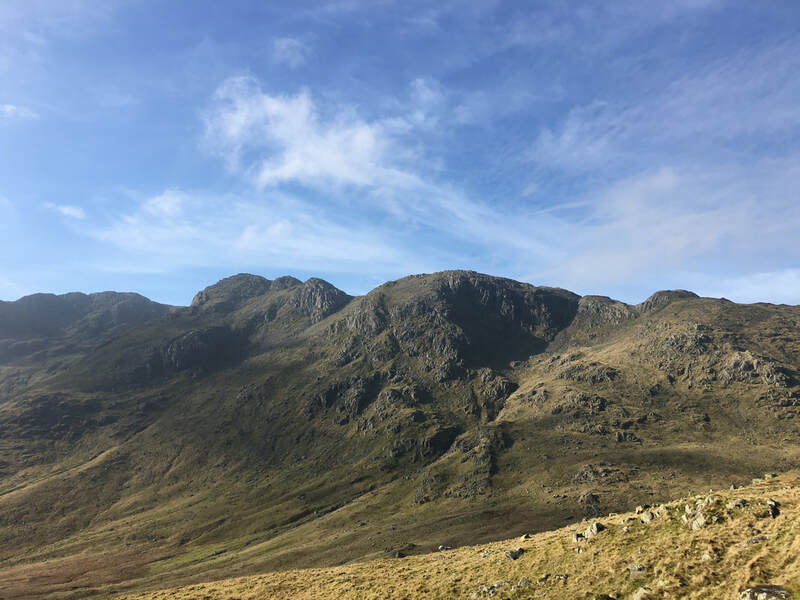 The plan today was to head for Bowfell via The Band splitting off the main path to the Climber's Traverse and to summit Bowfell via the scramble up the side of Great Slab. 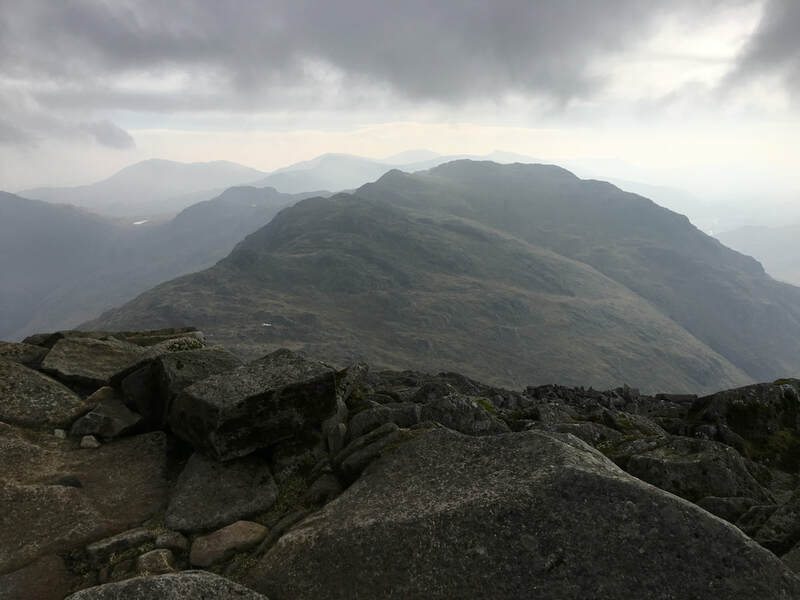 From the summit we would drop down to Three Tarns, climb over the Crinkles and see from there. 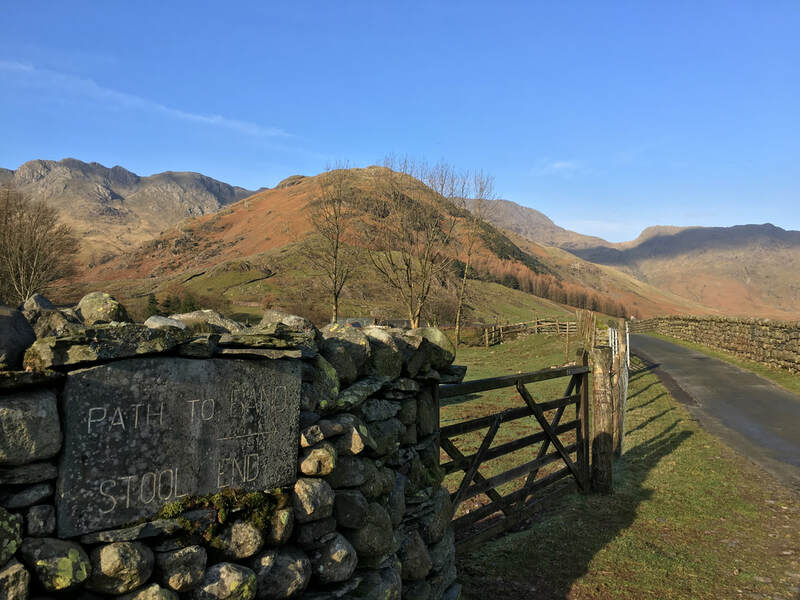 Depending on time we may go over to Little Stand then get back to Langdale via Cold Pike & Pike O'Blisco - we would see later. 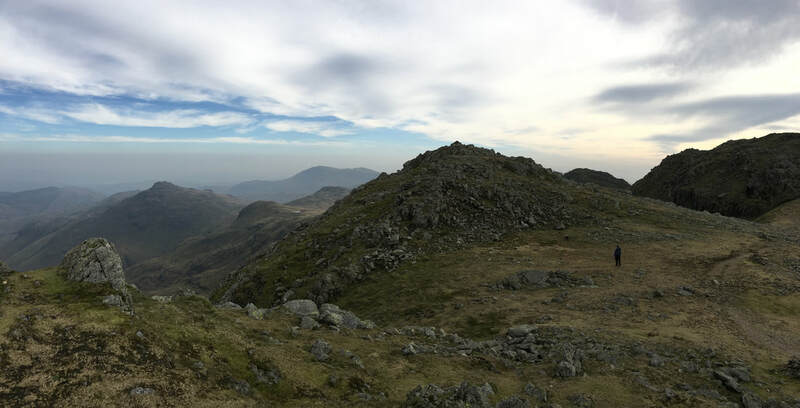 From the Car Park at the ODG the route heads firstly through Stool End Farm to then climb up The Band where from a cairn the path splits - carry on to the left to reach Three Tarns or go right to start the Climber's Traverse - it was here that the weather changed and we were presented with some slow moving wispy cloud and the sun left us for a while. 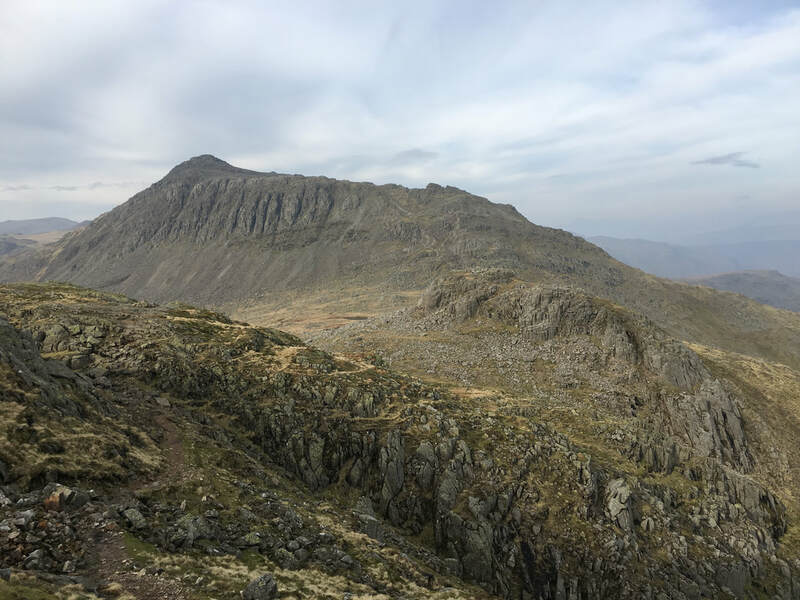 The name Climber's Traverse should not put people off - it is so called because the route traverses across the eastern face of Bowfell and was initially used by climbers as a convenient way to access the various pitches on Bowfell Buttress. 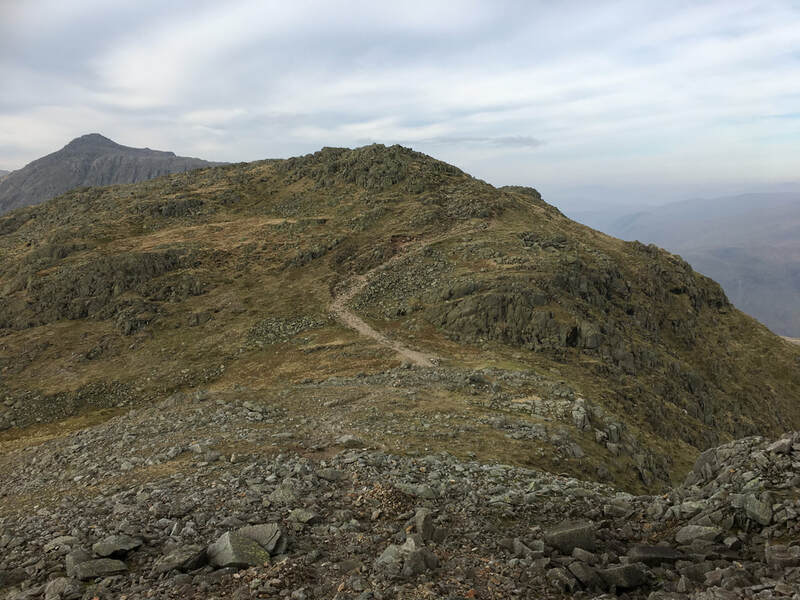 The path keeps level for the most part as it makes its way across the traverse of the lower slopes and there is only mild exposure - so much so we hardly noticed such were the views on offer. 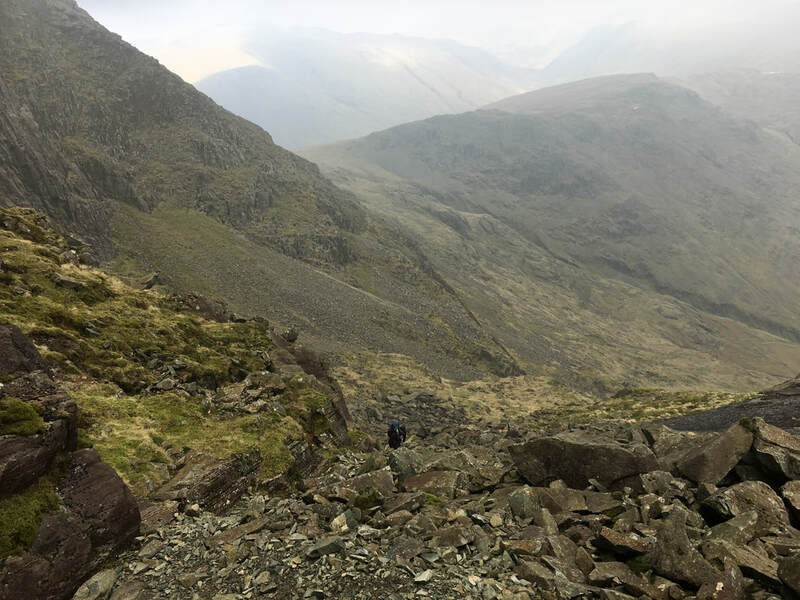 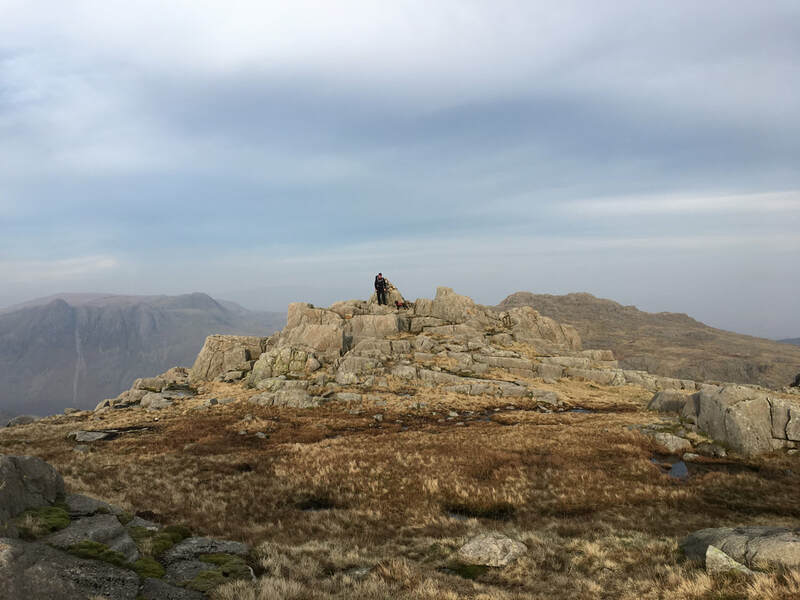 As we neared Bowfell Buttress I was keeping an eye out for a spring emanating from Cambridge Crag that marks the point to turn south and begin the ascent to Bowfell. 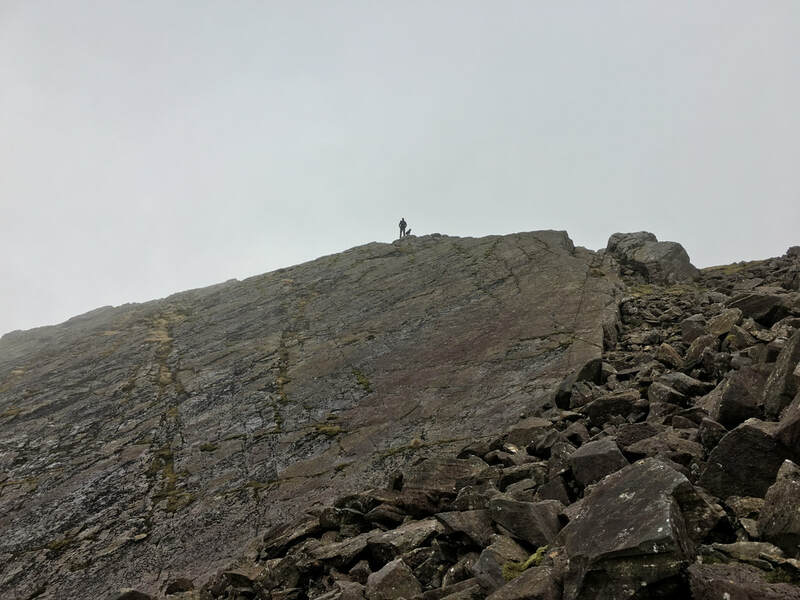 The climb is steep via a scramble over rock and after a short while the Great Slab comes into view on the left - when the top of Great Slab is gained it is worth walking along the precipice to look down over this remarkable sight. 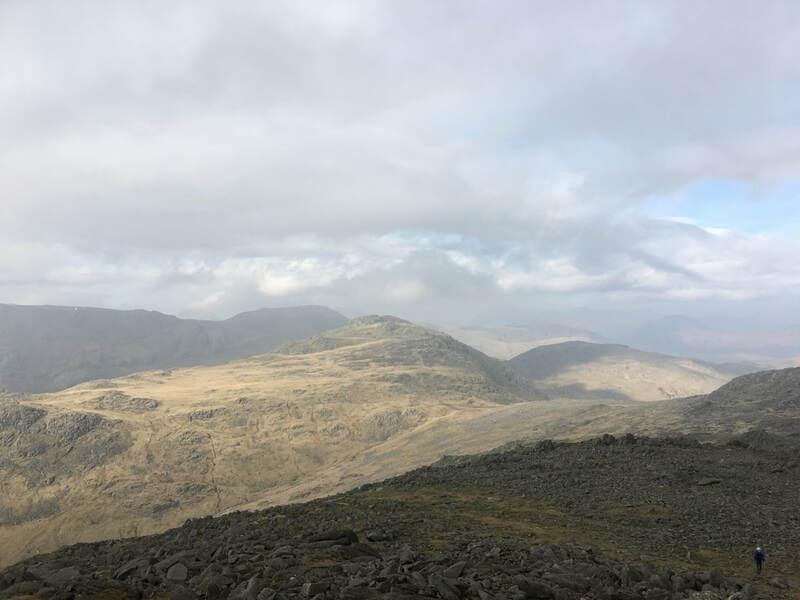 From Great Slab it was a short walk and climb to summit Bowfell where, as expected there are superb vistas in all directions. 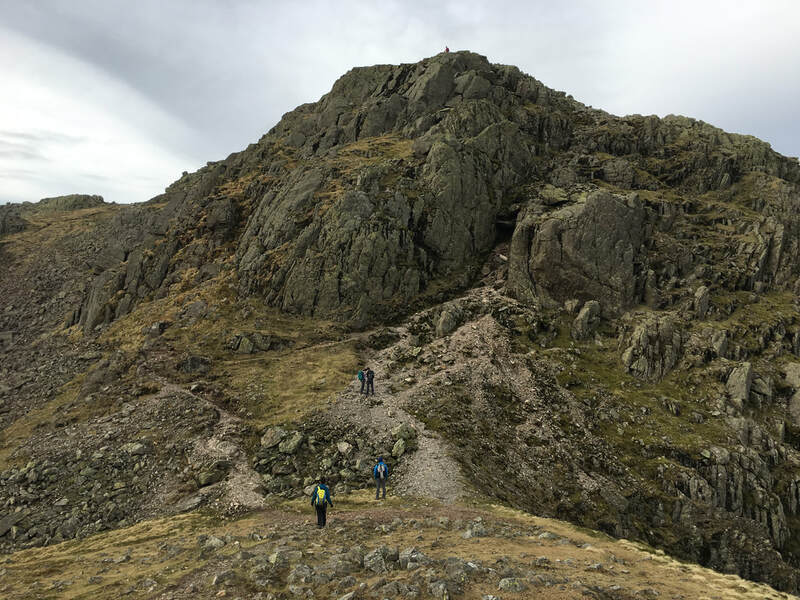 Retracing our steps we continued on past Great Slab to drop steeply down over a loose stone path to the top of The Band at Three Tarns. 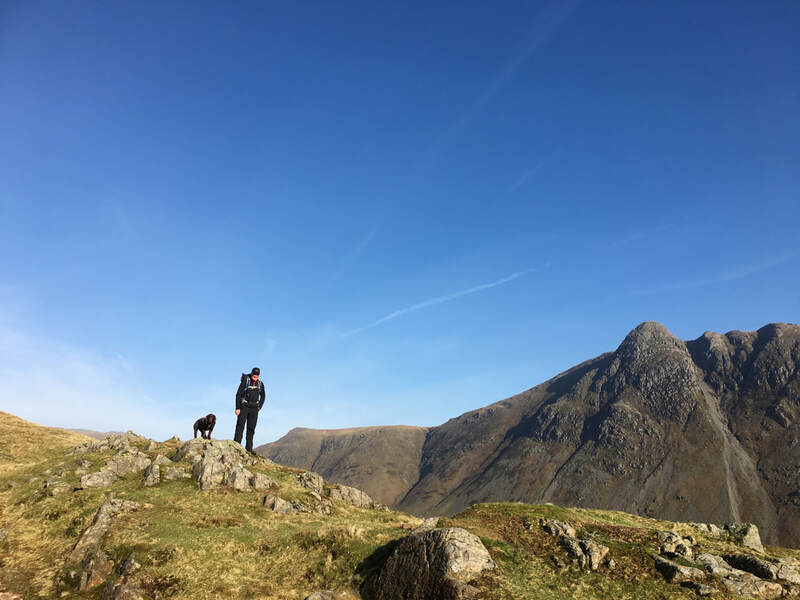 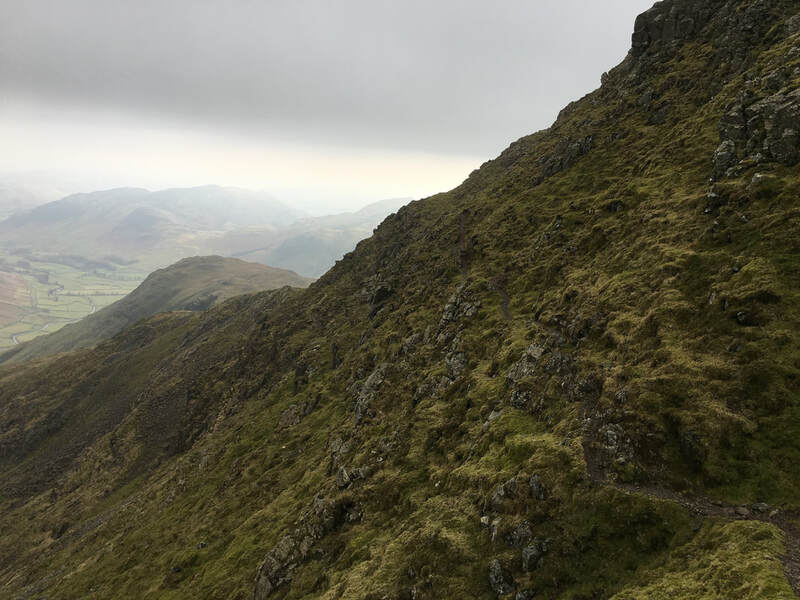 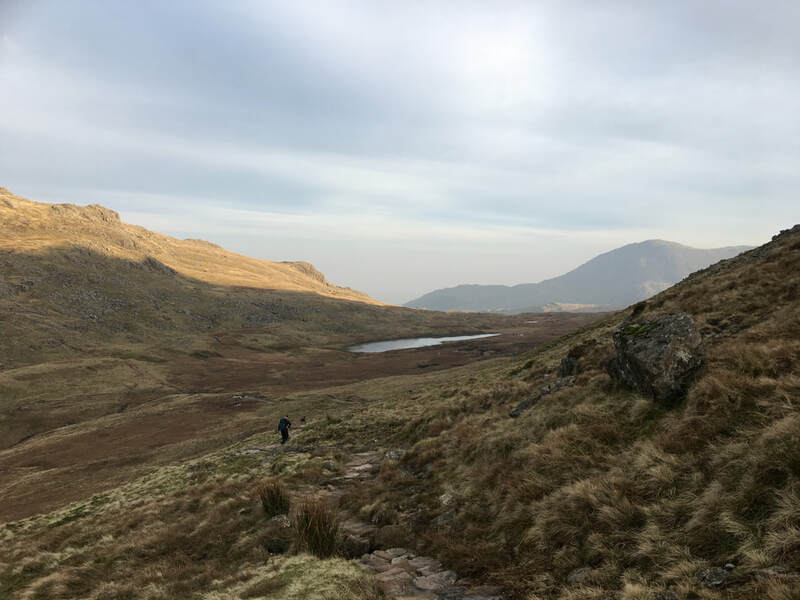 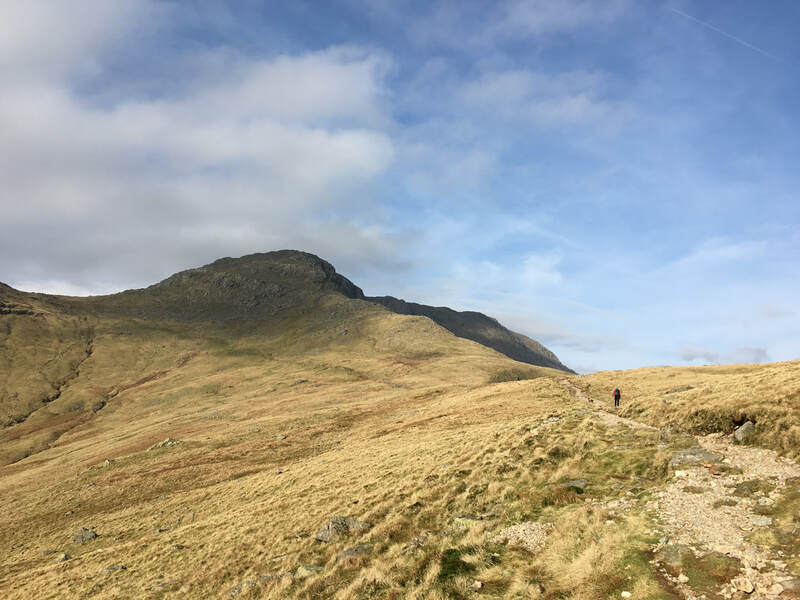 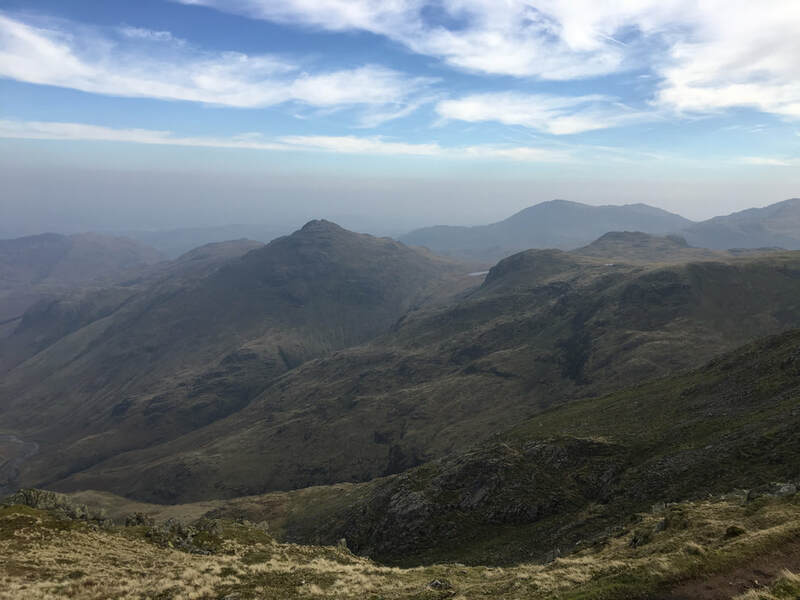 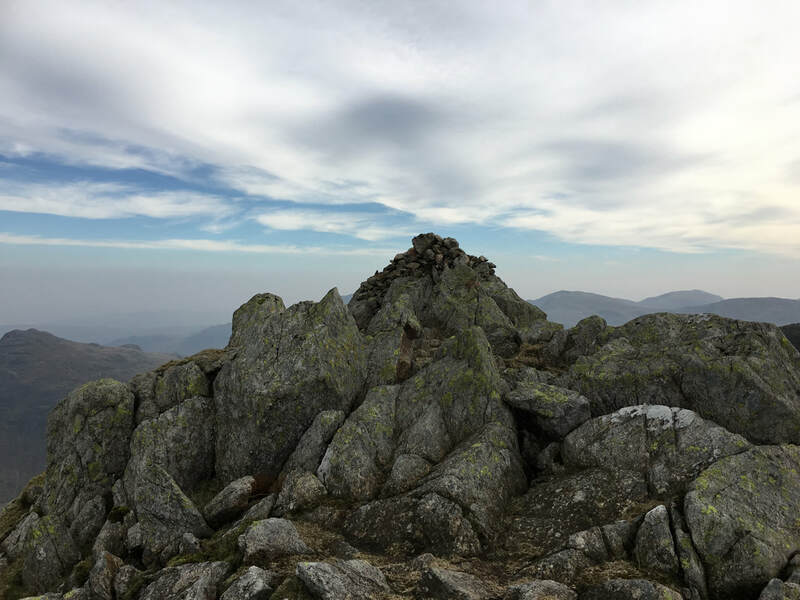 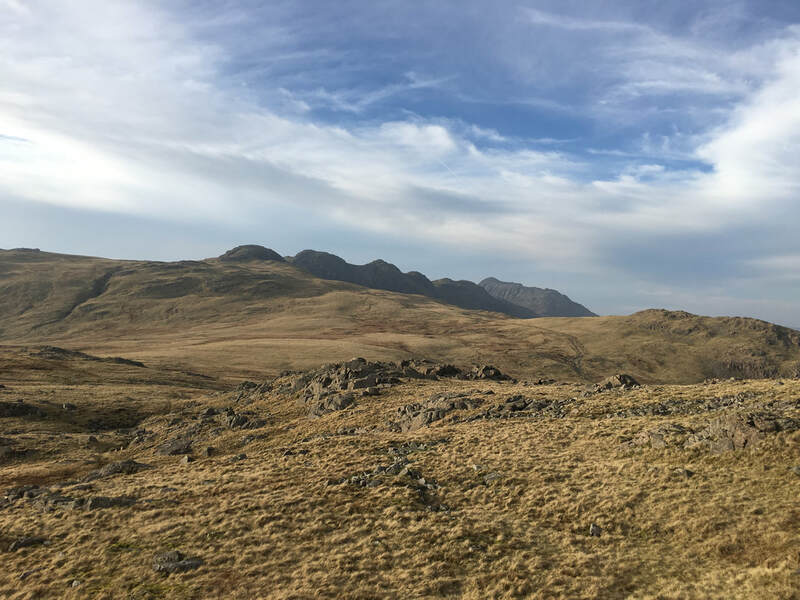 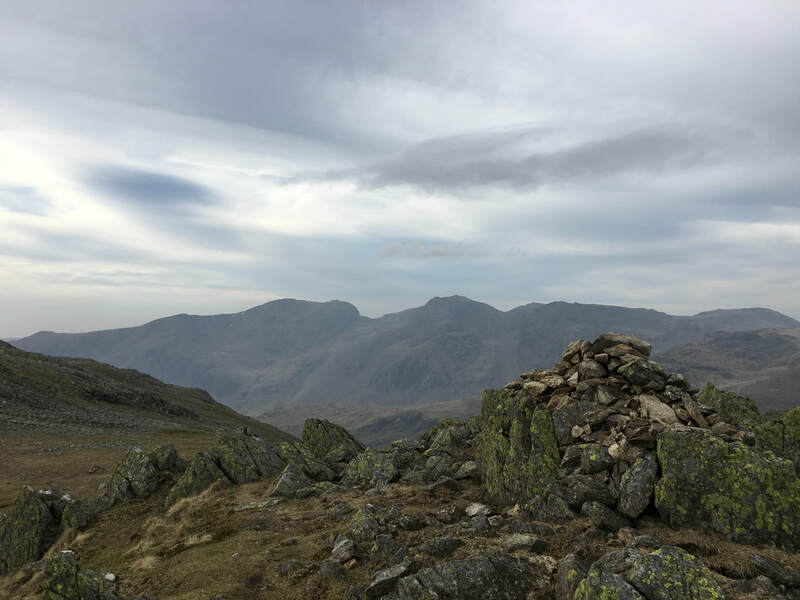 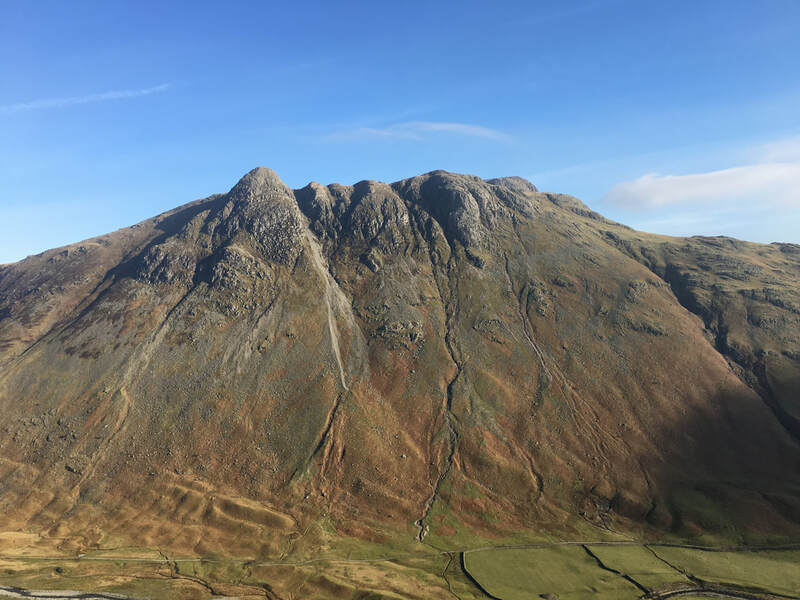 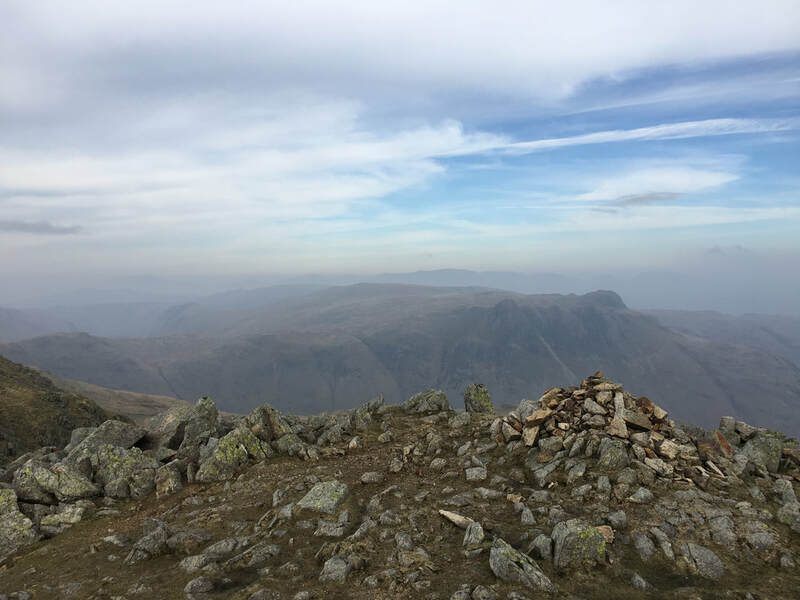 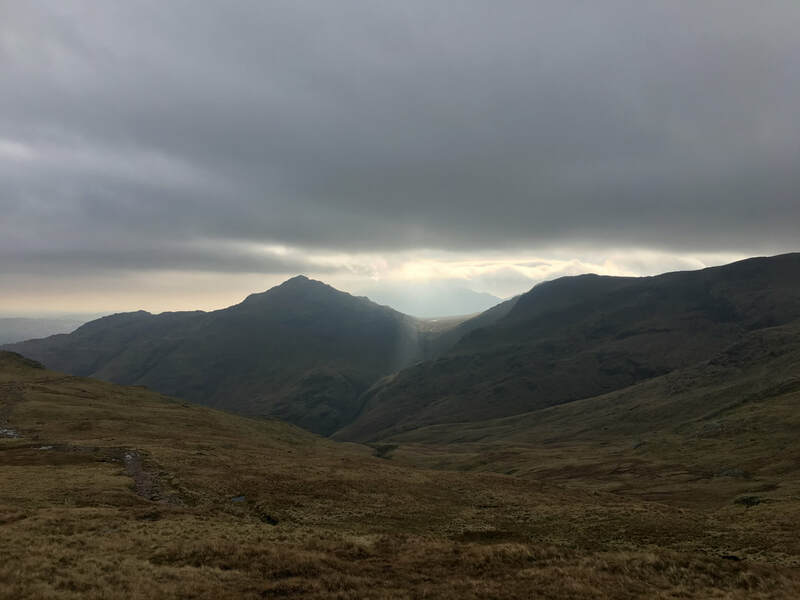 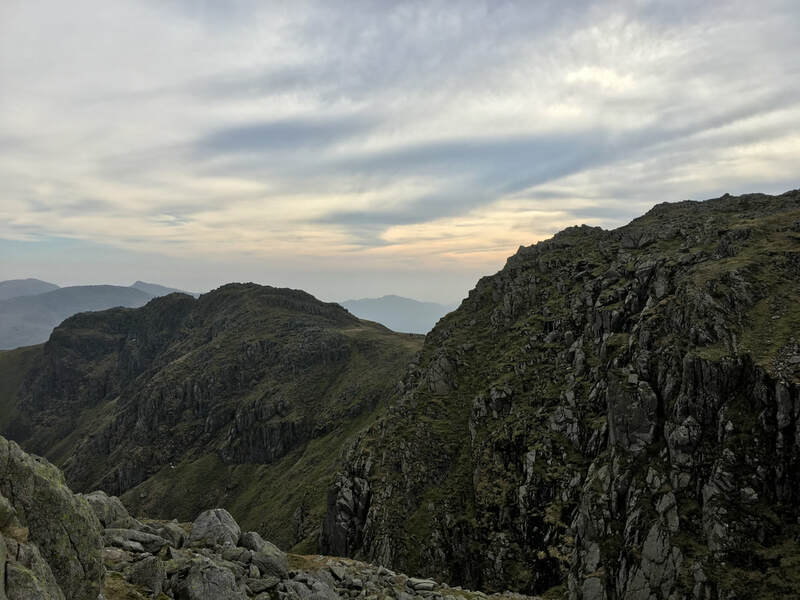 There now begins what Wainwright described as "Lakeland's finest ridge mile" and there is no doubt that the transit over Crinkle Crags is a superb walk. 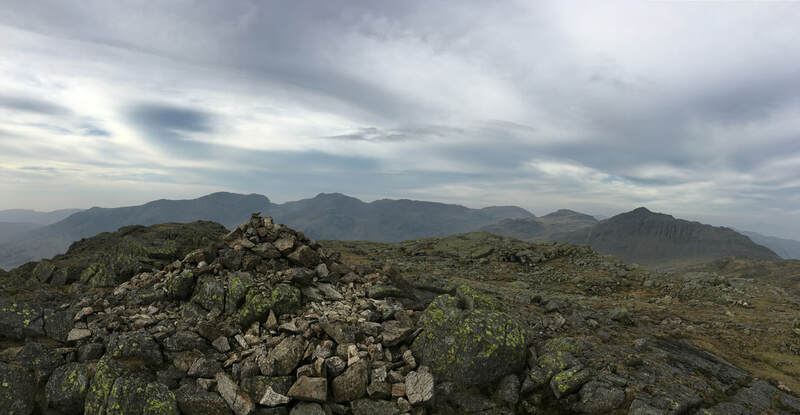 A rollercoaster of undulations which gives the eye differing views of the surrounding Lakeland panorama as each Crinkle is negotiated. 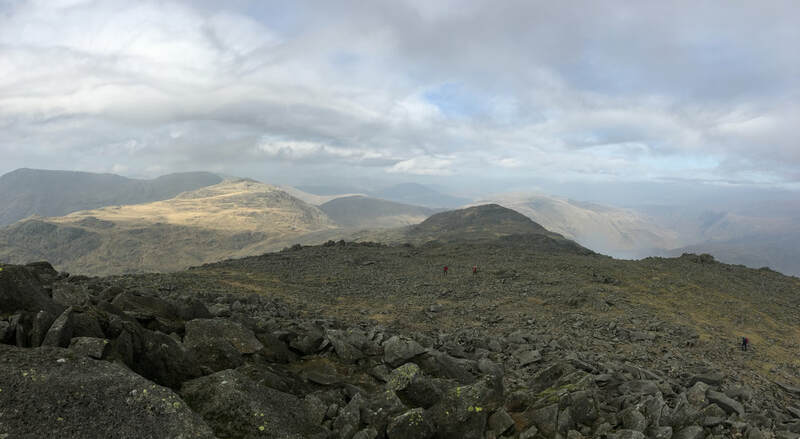 Descending our fifth Crinkle (or the first if you are coming from south to north) we were doing well for time therefore decided to head over the pathless route to Little Stand and from this picturesque summit another delightful transit via Gaitscale Gill to reach Cold Pike. 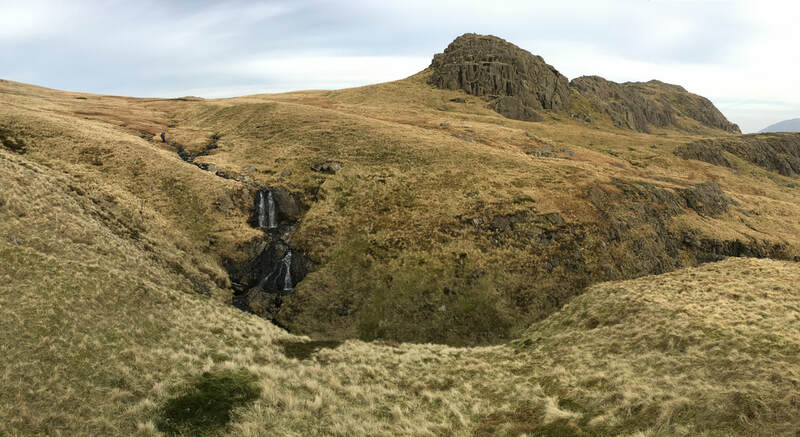 From Cold Pike we dropped down slightly to the north to pick up the main path coming down from Crinkle Crags which delivered us to the col near Red Tarn. 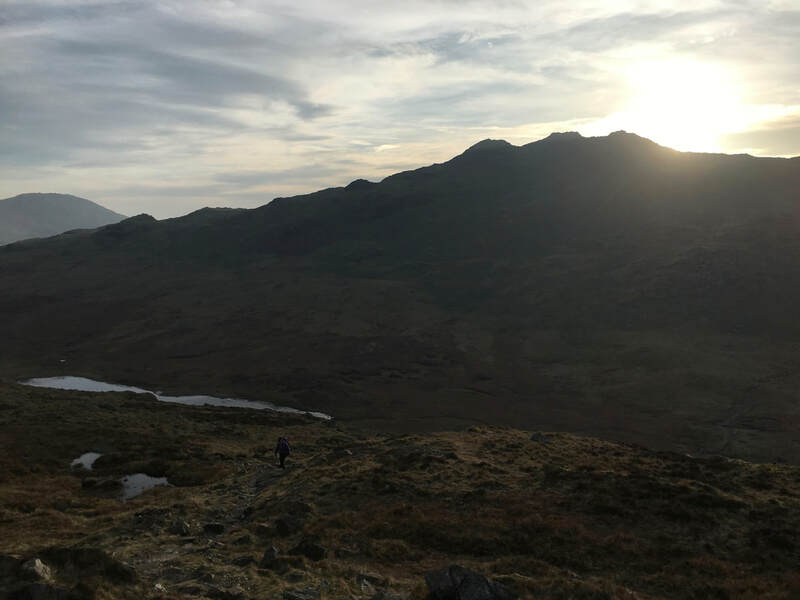 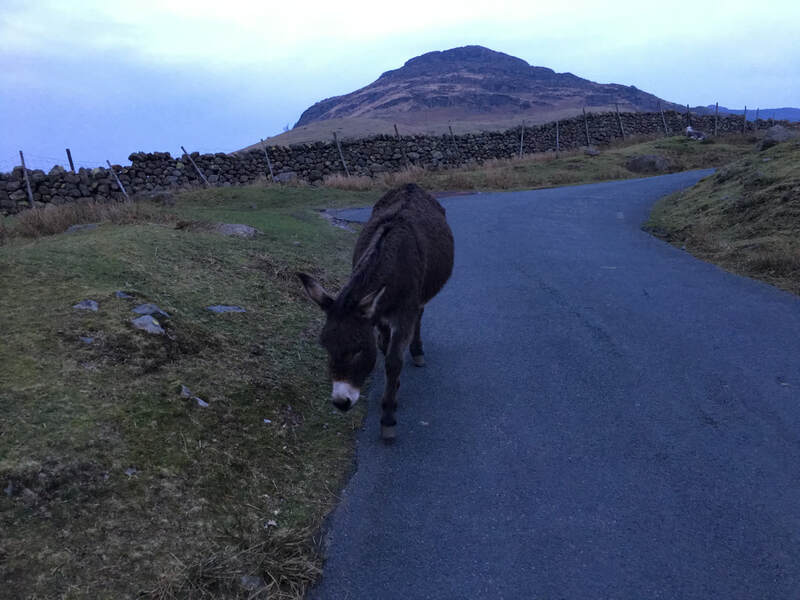 Here it was decision time - do we drop down to the valley floor via Brown Howe or make the short steep ascent up to Pike O'Blisco - we had an hour until sunset and head torches therefore it was no contest - Pike O' Blisco it was. 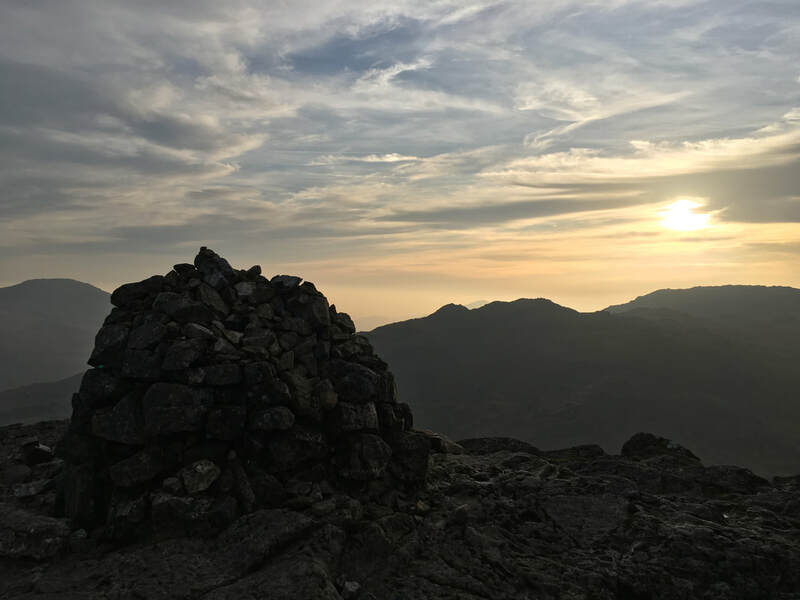 The decision to climb was well founded - from the summit there were glorious sunset views back over Cold Pike and over to the Crinkles. 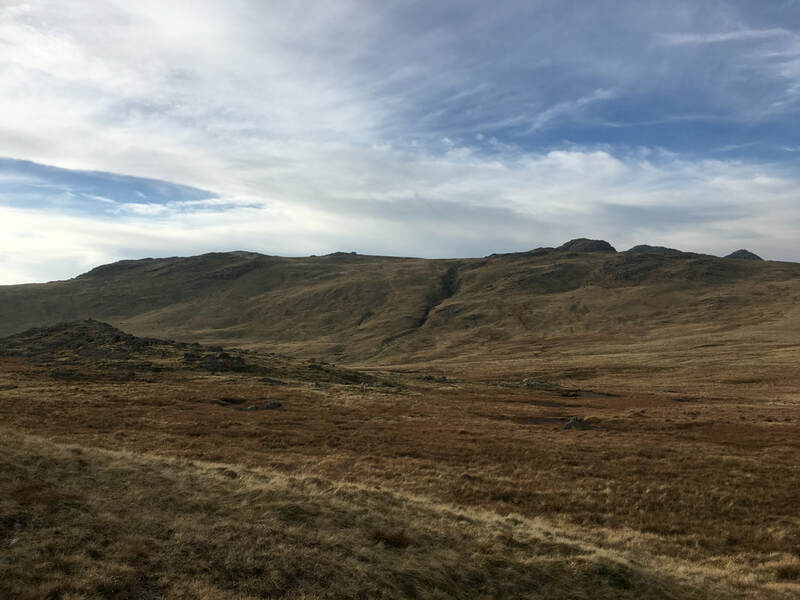 We then descended steeply over Wrynose Fell on the long schlep to reach the road to the south of Wall End Farm. 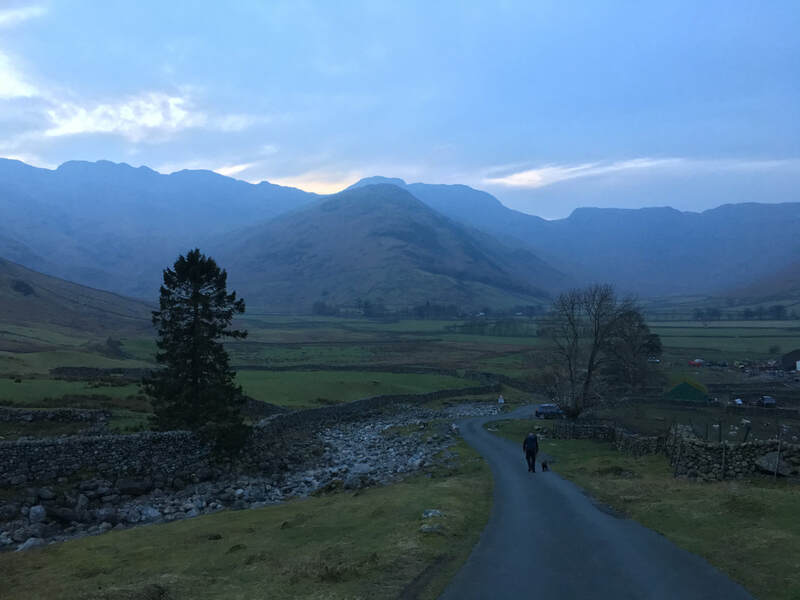 All that remained was to follow the road past the farm to reach the ODG. 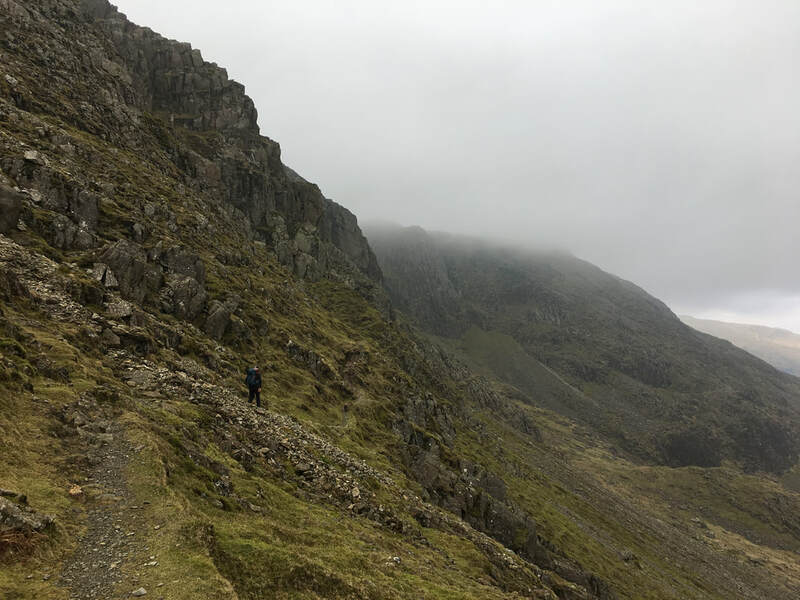 Another wonderful day out on one of Lakeland's classic routes. 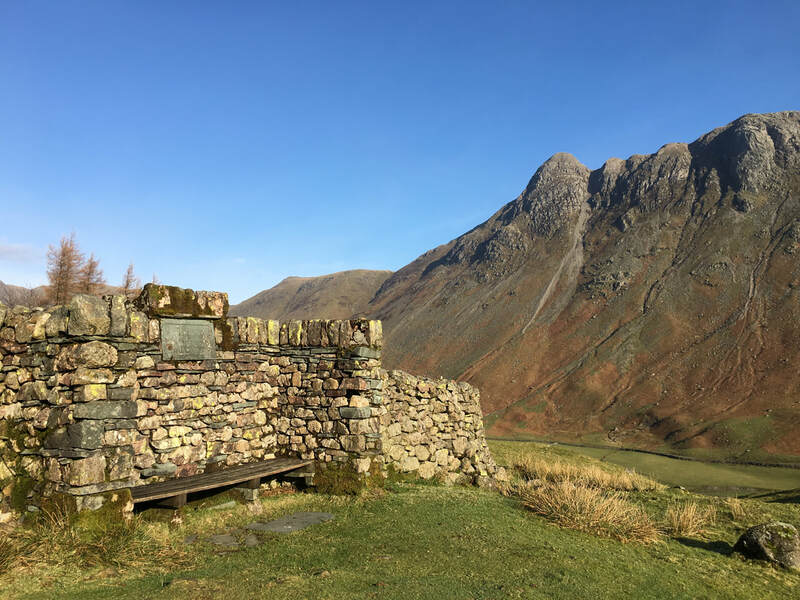 The memorial bench at the foot of The Band looking to Pike O'Stickle. 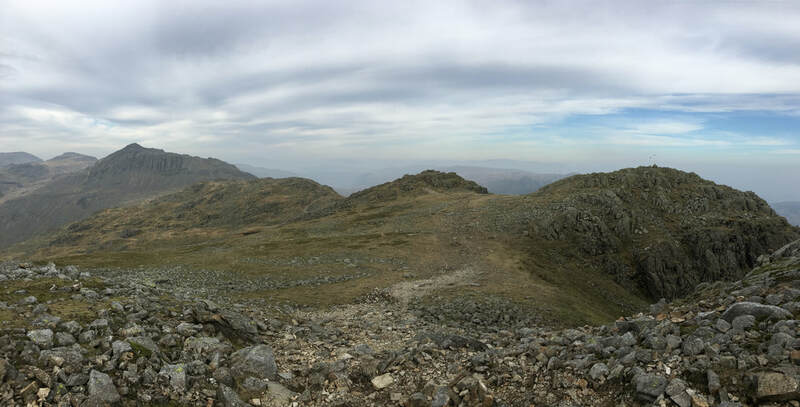 The top of The Band is to the left at Three Tarns with Bowfell left of centre. 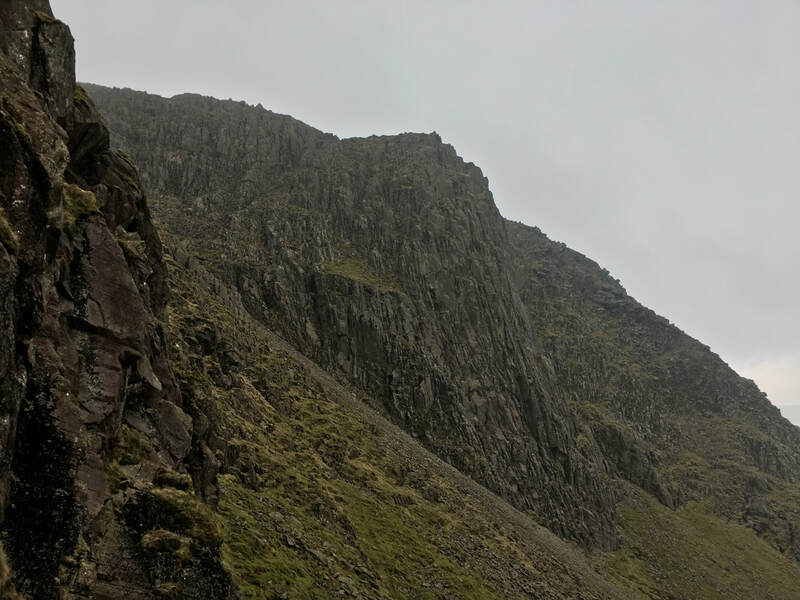 The path on the right leads to The Climber's Traverse. 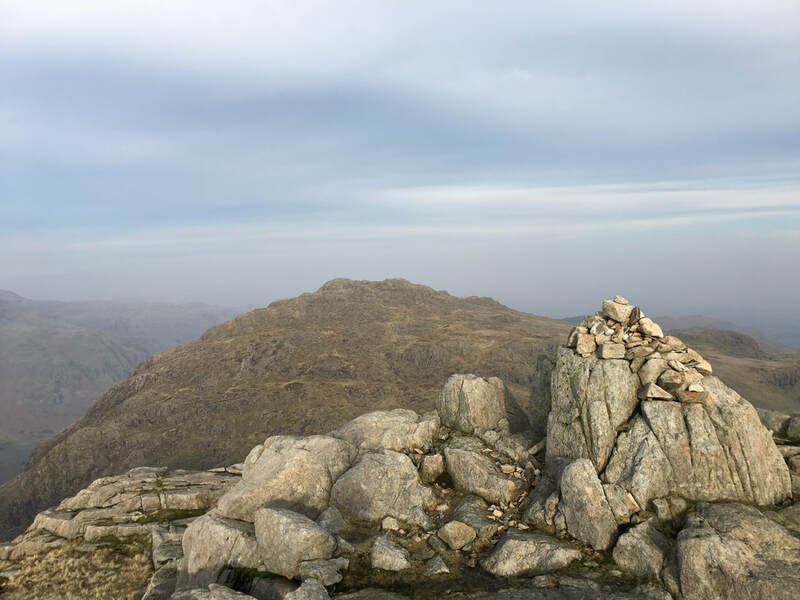 The cairn marking the point where the path splits - left to Three Tarns and right to the Climber's Traverse. 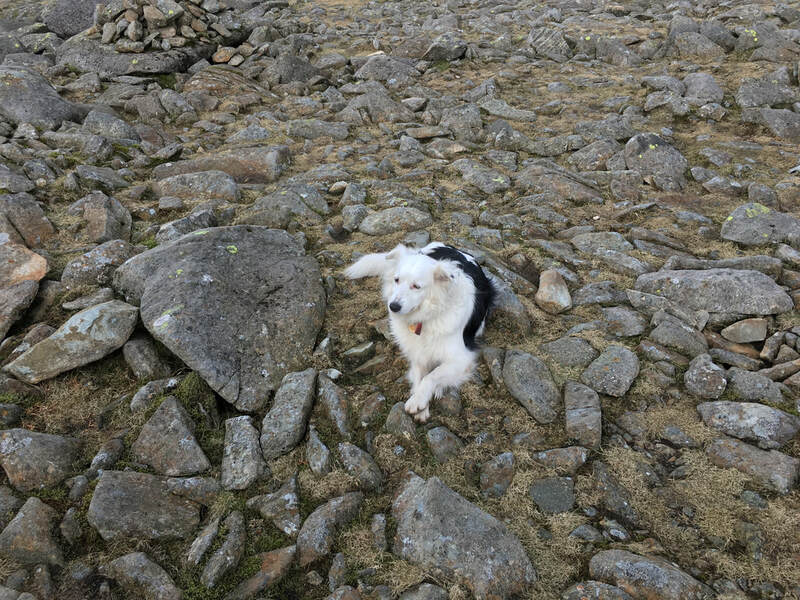 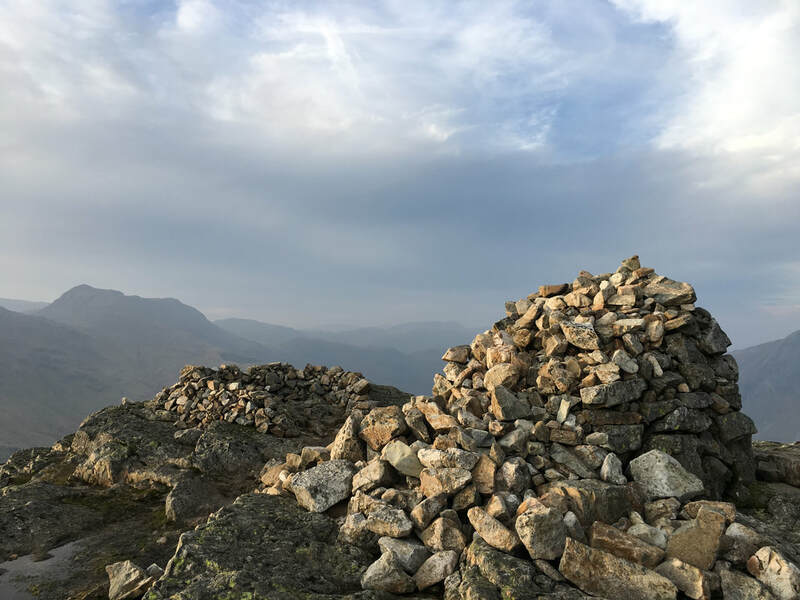 The cairn can be located at Grid Reference NY 25469 06160. 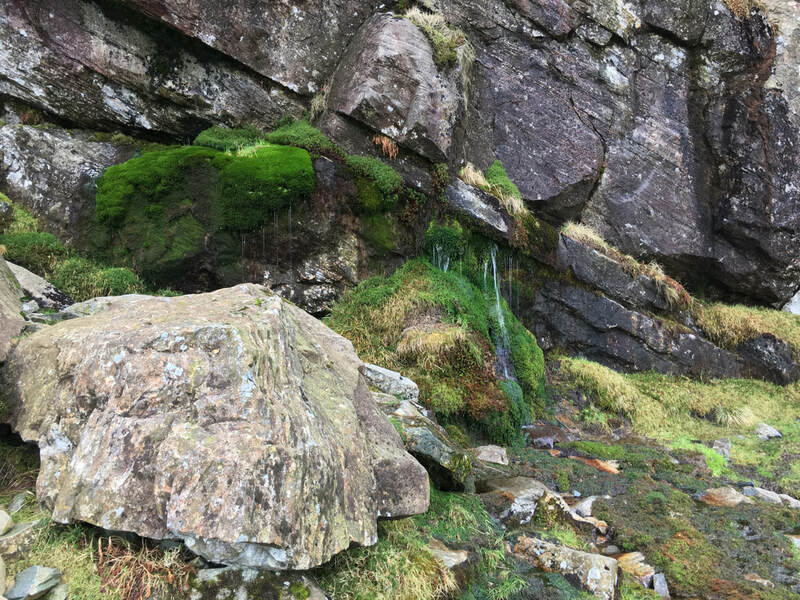 The stream gushing out of the base of Cambridge Crag which marks the point at which the ascent to the side of Great Slab of Flat Crags begins. 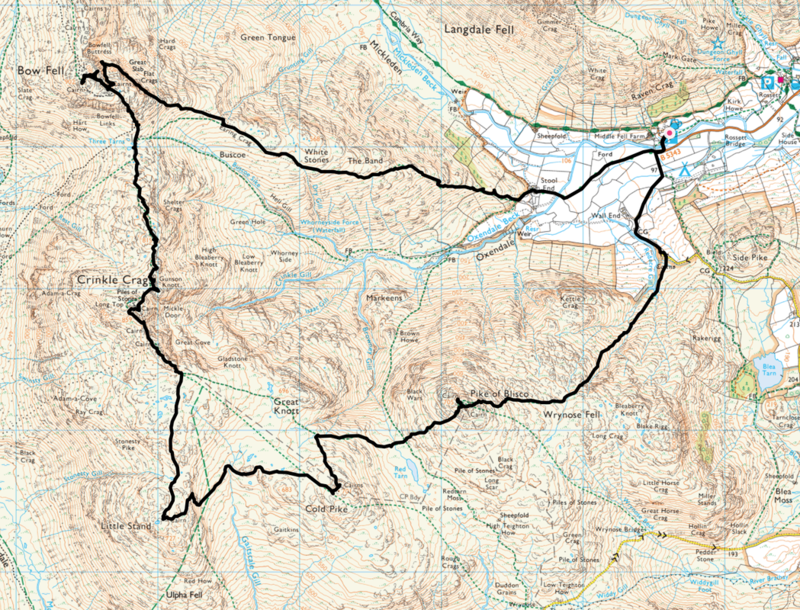 The stream is located at Grid Reference NY 24609 06599. 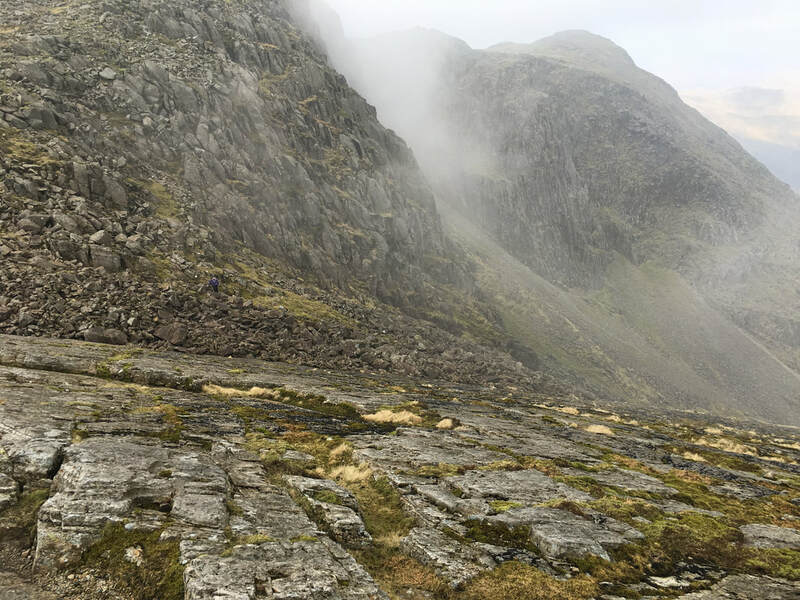 Looking down Great Slab from the top edge - Angie is the figure that can be seen on the rocks to the left. 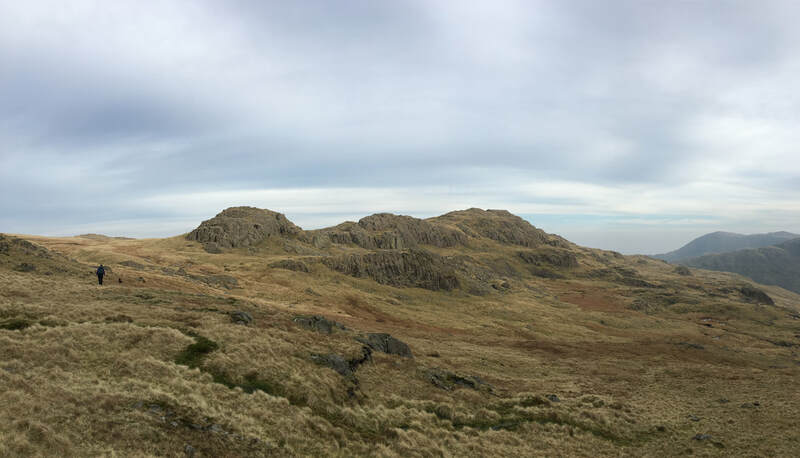 Wispy cloud was coming over now but thankfully it did not hang about. 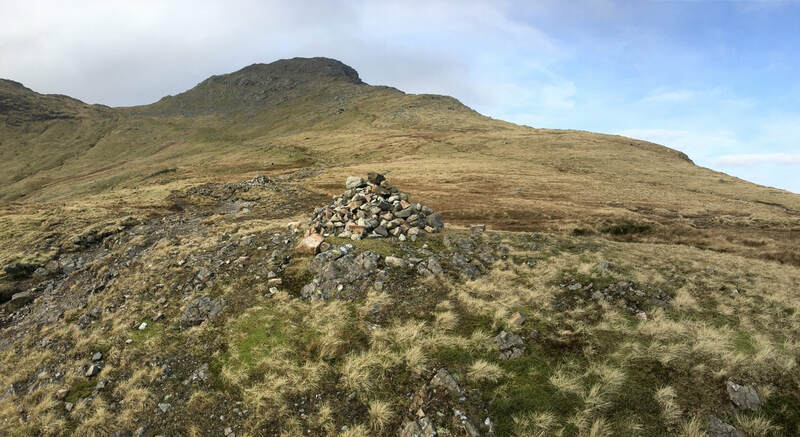 The summit to the rear is the Nuttall of Bowfell North Top. 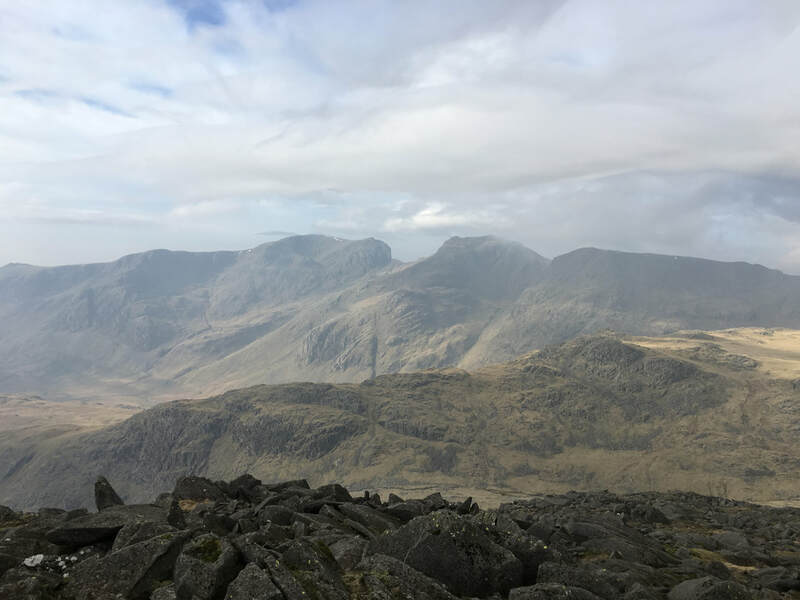 The Scafell range looking over Pike de Bield from Bowfell's summit. 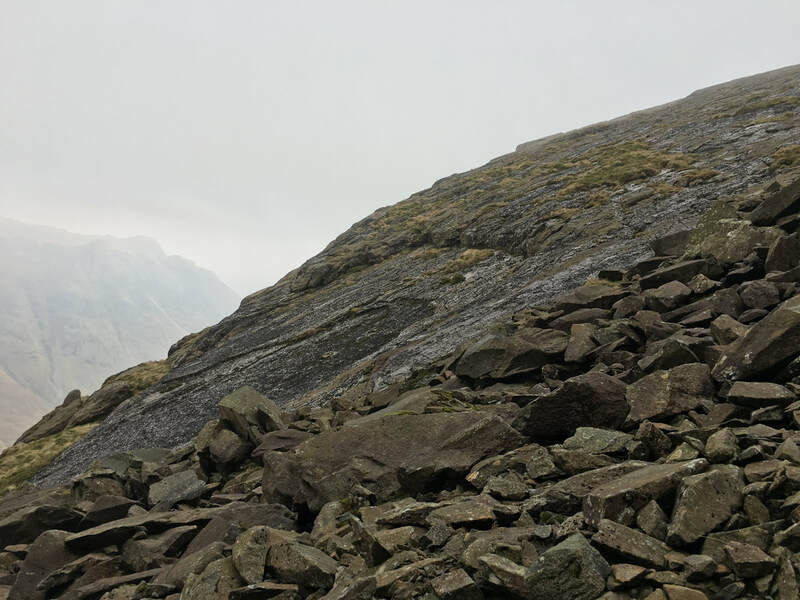 Wispy cloud over Great Slab. 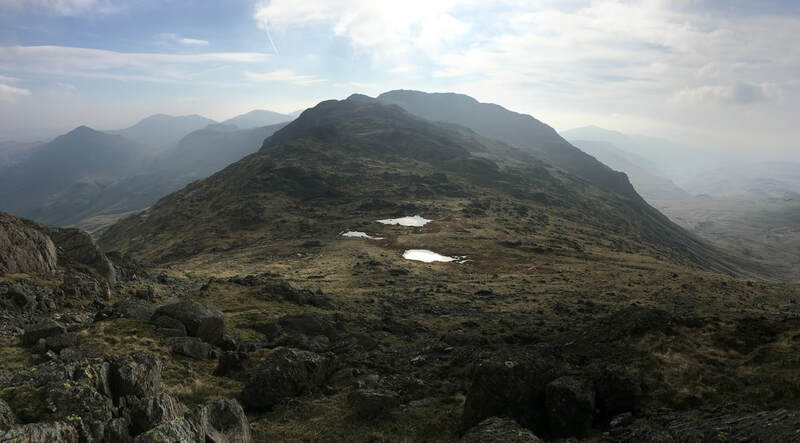 I am convinced people bimble up to Bowfell's summit from Three Tarns and totally miss this wonderful sight. 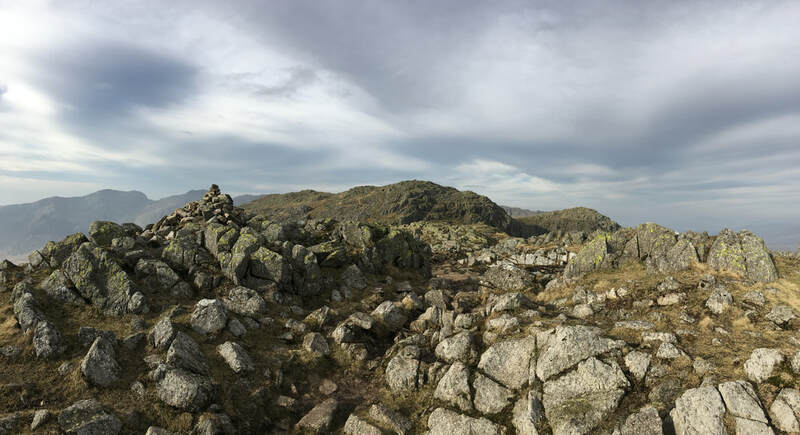 The top of The Band looking to Pike O'Blisco and is the point that the wonderful transit over Crinkle Crags begins. 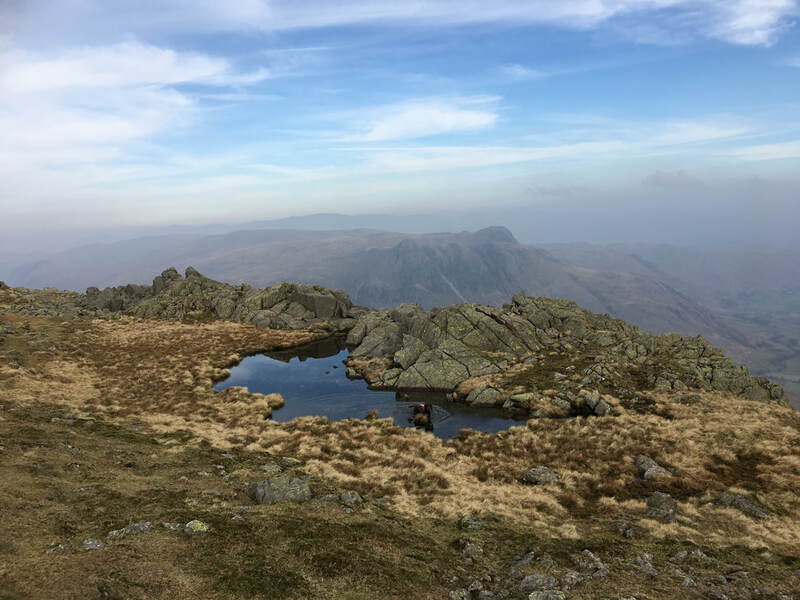 The ridge walk is just fantastic in any conditions - it is little wonder that Wainwright described it as "Lakeland's best ridge mile"
Always time for a dip eh Fudge? 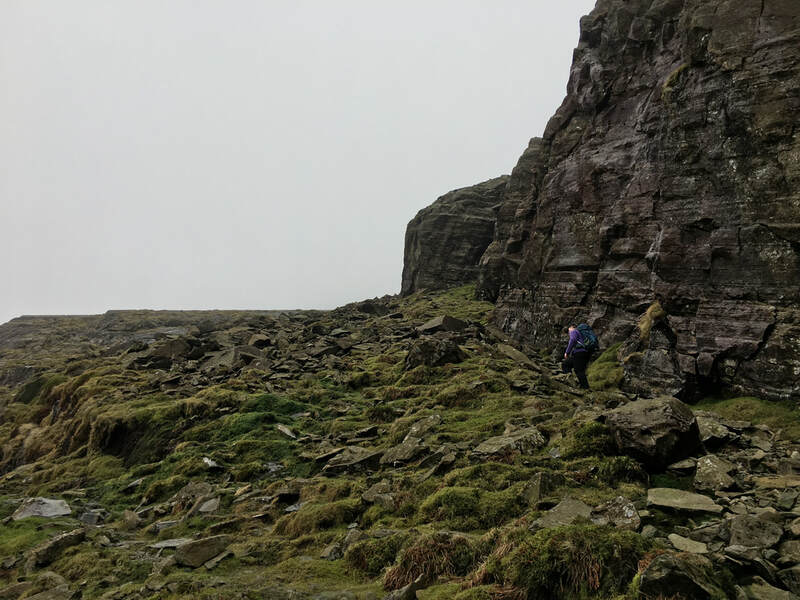 The Bad Step at the southern end of Long Top. 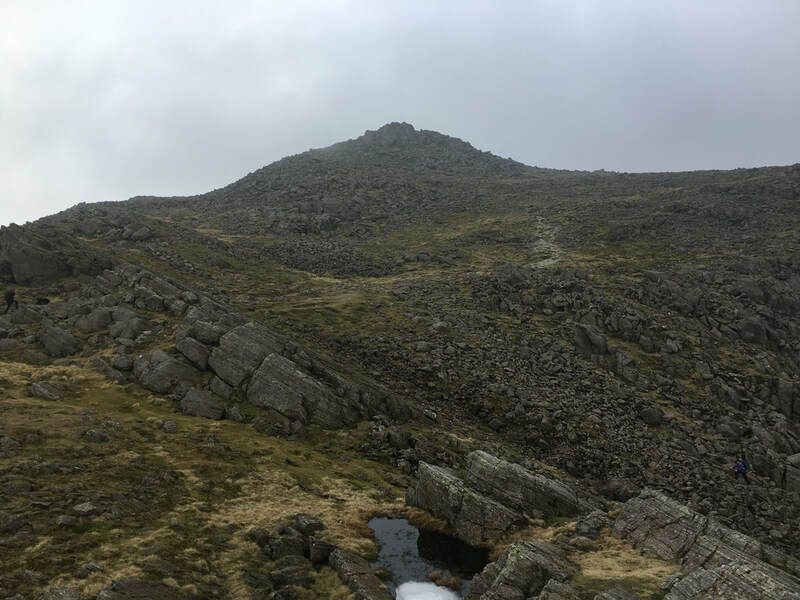 It is usually climbed on the transit from south to north therefore we used the path around to the west rather than descend this way. 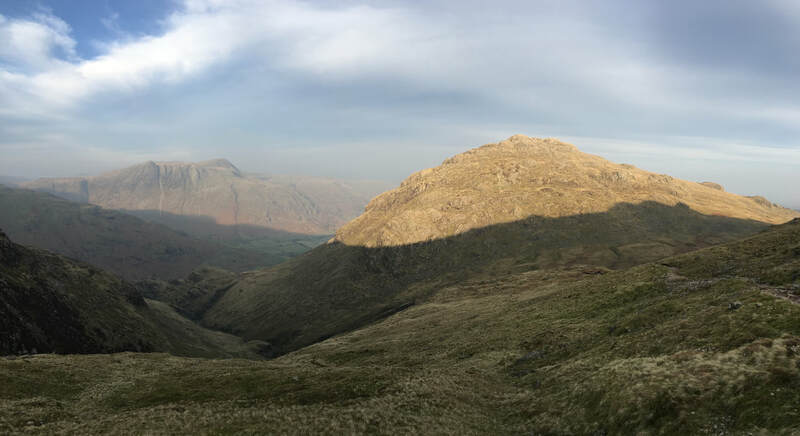 Dropping into the col between Cold Pike & Pike O'Blisco with Red Tarn centre & Wetherlam to the rear.